Fou-Lu Yu and Elena Davis are at the end of their adult lives. The big transition will change little for them, still happily unmarried. Emily Davis isn’t a little girl anymore and is quickly figuring out what she wants from life. 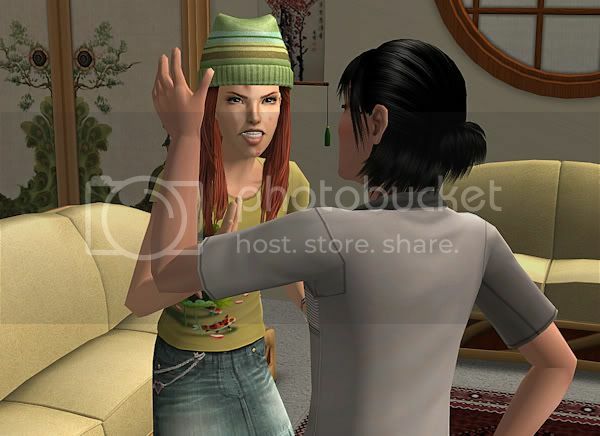 Now that Emma is back from college and living in Aperture, she visits often. Thankfully, the visits aren’t nearly as strained as they had once been. Elena and Fou-Lu were barred from giving her any help, but she was allowed to visit. It was difficult, to not slip her some money, but the repercussions from Gordon would be severe. Emma never asked for help, she toughed it out, happy to just see her family. Emily was always quiet during her older sister’s visits. They’d never been terribly close. 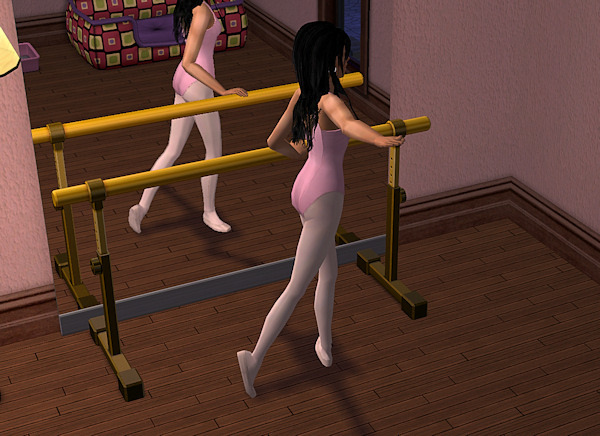 Emily shared her mother’s love for dance, but in a more casual way. She wasn’t sure if she wanted a career in it, in fact, she wasn’t sure she wanted a career in anything. She wasn’t so jaded to think life was easy and the streets were paved with gold; she was just aware that she had an opportunity most didn’t–she could decide what she wanted to do. She was going to take her time and figure it out, find something she truly loved. Elena and Fou-Lu’s birthdays snuck up on them before they realized it. They’d gone through a lot together and despite being so different, had managed to make it work in the end. Sure, they bickered sometimes and even argued, but it was just part of the deal. When you’re so different, you’re bound to run into conflict; the entire point was that they got through it and loved one another despite it. Emily had to be careful not to fall into her older sister’s footsteps. Being who she was, she fell easily into the ‘elite’ group of teens in high school. Despite living in Aperture, she attended the same academy, so her circle of friends consisted of Alexander and Charity Saunders. Emily and Charity didn’t always see eye-to-eye, but Alexander was the mediator between the two. To Emily, Charity was just too wild and to Charity, Emily was just a big old prude. They would gather at Emily’s house sometimes, when it was convenient, usually on weekends. It was located downtown and surrounded by all sorts of fun things. All their families had money, so it isn’t like they had to worry about not being able to pay or make their way around. Deidre O`Hanlon, of course, was their leader. It was her exotic looks and ridiculous charisma that had drawn so much attention and popularity. Being the daughter of a famous actor and director sure didn’t hurt, either. Never far behind Deidre was Dominic Knight. The opposite of Deidre’s outgoing and charismatic nature, Dominic preferred brooding stares to actual conversation. It was a front, of course. Dominic was as friendly as the next, but he just preferred to leave all the senseless talking to Deidre. His sister, Nadia, was excluded from the group given her childhood rivalry with Deidre. Deidre had been willing to let things pass, but Nadia had gone a step too far when she insinuated that Deidre’s eyes were contacts. That was the last straw. 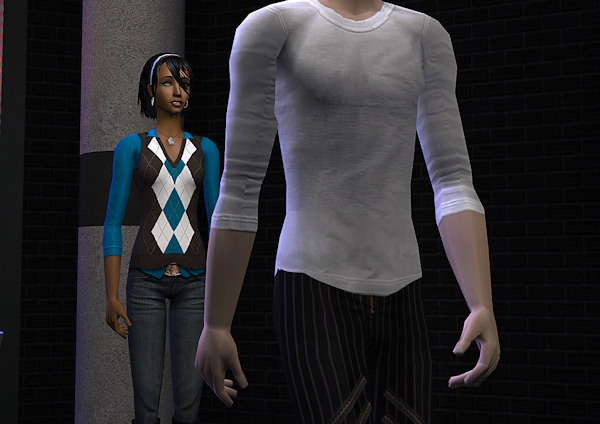 Charity and Alexander Saunders, unlike Dominic and Nadia Knight, are inseperable. When you see one, you can be sure the other is not far behind. It’s a miracle they manage to use the gender restricted bathrooms without going into shock. While not as brutal as their older sister, they still have a bit of a mean streak to them. It’s usually a good idea to stay on their good side. Alexander effectively ‘blocks’ any male that might try to take Charity up on one of her lewd offers. Emily Davis, compared to the rest, seems unremarkable. She knows that’s not true and she’s quite content letting them take the spotlight. She’s the one behind the scenes, directing the events and moving the players around on the stage. She’s the nicest one in the bunch and usually tries her best to keep the peace. She still talks to Nadia Knight and while friends with everyone in the group, is closest to Alexander. Note from Mao: Nothing exciting at the Davis house, unfortunately. Emily is a Family sim so she’s obsessed with her first kiss, but there aren’t any compatible male teens out there for her yet, sigh. She’ll have to wait! She’s part of the it-group because she befriended Alexander. These guys make a scary little group. I wouldn’t want to go to high school with them. It would be so easy to hook Alexander and Emily up. Of course, it’s weird because Michael and Elena consider themselves siblings even though they’re not. They’d guarantee me some CC genetics and nice face structures. 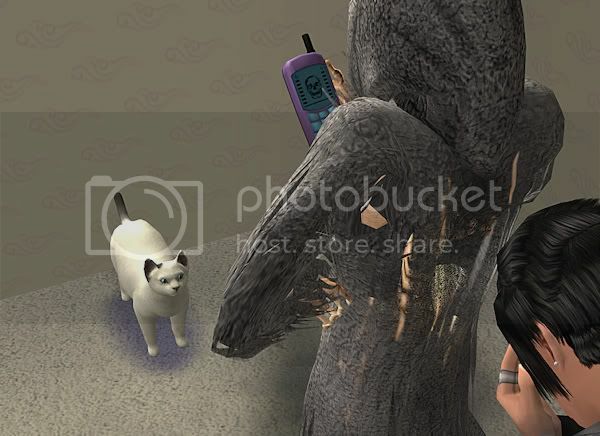 Unfortunately, unless the sims press the issue, I won’t. The Elena/Michael thing would be enough for Michael to throw a fit and Elena to be disgusted, LOL. If they did press it, it’d make for a hilariously gross storyline. And now, a funny outtake picture. Dominic starts talking about aliens and Deidre just has this look on her face, LOL! I think she’s tired of hearing it, poor girl. She’s smart, but everyone only knows her for her “exotic looks”. Marcus Yu and Valerie Alioto have no plans to get married and are quite settled into their life as it is. Megan Alioto is a happy and fulfilled child. Can Valerie maintain her cover while working for Gordon? Valerie’s job with Gordon usually had her out at all hours of the night. He didn’t have her doing anything illicit, but their meetings had to be during the night and they always had Valerie returning late into the night. He had tasked her with keeping tabs on his grandchildren by Kit, Dominic and Nadia Knight. It was an easy job but when Gordon said he wanted to know everything, he wasn’t kidding. 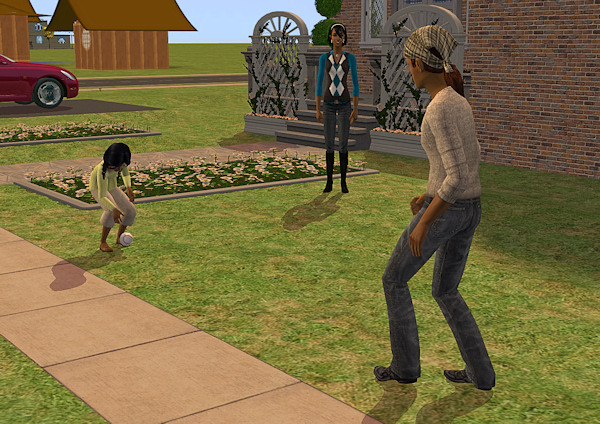 It took all of Valerie’s skills and tact to keep her cover while she kept an eye on her daughter’s new friends. She also felt guilty. Spending so much time with Gordon, she had developed an unfortunate crush, one that hampered her ability to think clearly. She found herself drifting off in conversation, somewhere else entirely. It was beginning to haunt her and make her uncomfortable. 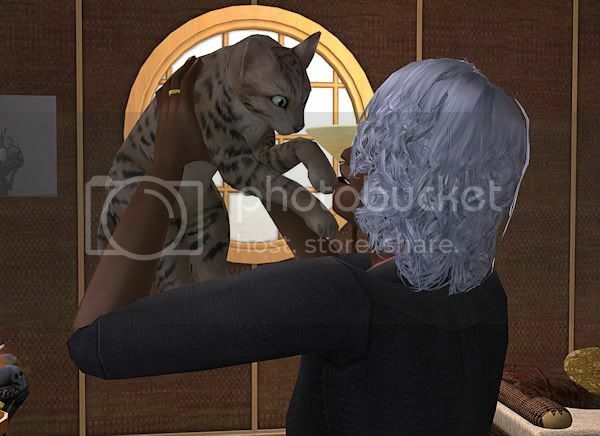 She cared about Marcus and she certainly didn’t want to disrupt her daughter, but she couldn’t shake the feeling that overcame her when she saw Gordon. Maybe it was because he knew what she did and she didn’t have any secrets. Megan became good friends with Nadia, much to Valerie’s delight. Everytime she saw Megan smile, she was reminded why her infatuation with her criminal, vampire boss was ridiculous. Besides, it wasn’t like her life was so bad, it was great, especially compared to the majority of the neighborhood. Most were caught up in crazy dramas and scandal, but Valerie and Marcus, despite not being married, always managed to keep their heads above water. They were happy with their relationship, feeling no need to push it further. They had Megan and that’s all they needed to bind them together. Still, there was Gordon and meeting him in crowded, dark bars certainly didn’t help damper the thrill or excitement she felt near him. It wasn’t the vampire thing, she’d never been much into that, but simply his personality. He revealed so little, yet she knew all the textbook stuff, the marriages, the scandals, what he’d done, what he didn’t do but was accused of anyway. She knew it was wrong, but anytime she was near him she forgot about her obligations as a mother and girlfriend, throwing them to wind as carelessly as a whimisical teenager might. He raised his hand to stop her, but instead of falling silent, she took it into her own. His skin wasn’t icicle cold like she had anticipated, warmth danced beneath the surface, not as plentiful as her own, but there, nonetheless. Some semblance of life behind the marble complexion. Valerie had no chance to reply, Gordon disappearing across the street and into the shadows. She felt an overwhelming guilt, his words ringing true in her ears. Even so, she couldn’t push it out of her mind. It was there, a thread hanging between them, vibrating with tension. It wasn’t going to just go away. Gordon refused to see her for several days, telling her instead to take a couple of days off and remember what’s important. His intentions were good, but Valerie had no mind for it. 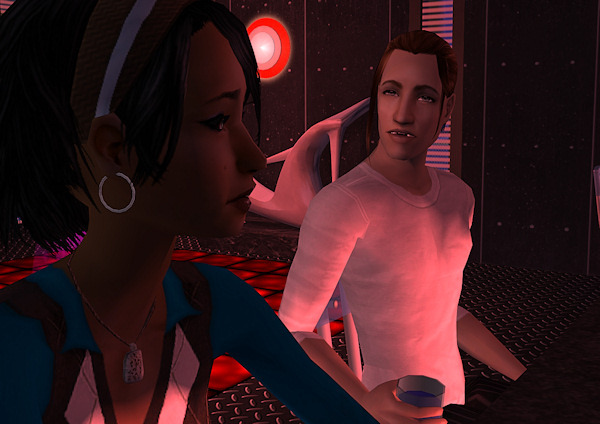 She spent time with Megan and Marcus, but always, lingering in the back of her mind was that single, brief touch. It was a direct contrast to the hot water surrounding her and Marcus’ warm hands working the knots out of her shoulders. “You feeling okay?” He asked, trying not to sound too worried. Note from Mao: Poor Valerie is so conflicted. She bounces between wants for Marcus and wants to see Gordon. Gordon is staying neutral, but ACR has them flirting whenever they’re near. Despite this, I can’t see Gordon diving headlong into anything, especially not this. Which is why I’m going by wants that make sense and not ACR’s constant need for flirting. 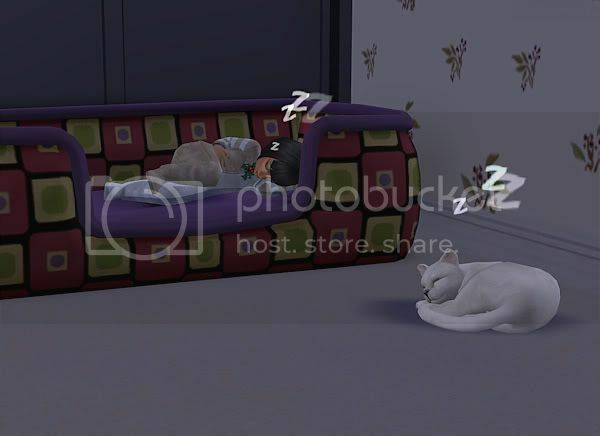 I’m just hoping that she doesn’t drop in while I’m playing Gordon’s house, because there’s waaay too many beds and I’m never quick enough to stop WooHoo’s that totally should not be happening, lol. Zhou and River Yu have their only son to inherit the house. Fujin feels the press of the weight, but still seems intent on finding a way to do what he wishes. It had always been assumed that with Fujin’s natural capabilities, he would go to University. It was the natural progression of things. Fujin, however, was having second thoughts. He was smart, yes, but he was so much more than that. He didn’t want to be one of those people pigeon-holed into some old stereotype. He wanted to be who he was, Fujin, without any binds or confines forcing him into some little, rigid box. He had contemplated many ways of telling his parents. So far, he was still too chicken. 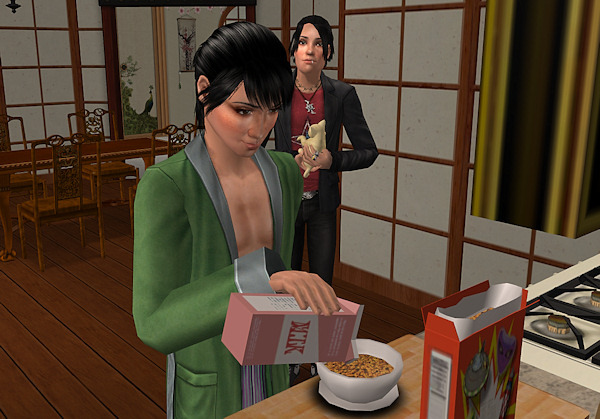 Fujin knew that passing up on University would really slim down his chances of meeting that one, special person. His parents had gotten together in college, after all. A long, rough road paved with stubbornness and adversity. Still, they seemed pretty happy now, something that further fueled Fujin’s own desire to have that someday. Fujin sat alone at the old playground, lost in his thoughts. Rain poured down around him, tapping against the plastic roof over his head. He was much too old to play on the equipment, but he often came here for some quiet when the kids were all still in school. He was surprised, then, when he heard someone climbing the other side. “It doesn’t have your name on it,” Fujin joked. Grace Saunders climbed the rest of the way up and sat down on the plastic floor. She looked over at Fujin, regarding him apprehensively. “I’m plenty smart,” Fujin quickly replied, slightly offended. Fujin returned home, determined. He was going to sit down and talk to his parents, he just needed to figure out what he was going to say. It was on the eve of his high school graduation before he decided to come out with it. He had sent out University papers, just in case, but he was pretty sure he wasn’t going anywhere. After the travesty that was his “university” speech, things settled down. His mother eventually resumed speaking to him and his father was sure to reassure him. Zhou had never really cared for University, he only went for River. At first, Fujin had been uncomfortable about his decision, but as time passed and his birthday approached, it felt right. Rosa still came over. She didn’t talk about what had happened with Francis or Emma, but Fujin was sure it wasn’t good. She just seemed down, but he wasn’t going to press the issue. Dealing her all emotional and angry wasn’t exactly something he enjoyed. “You’re cheating!” Rosa snapped, shaking her controller in an angry fit. 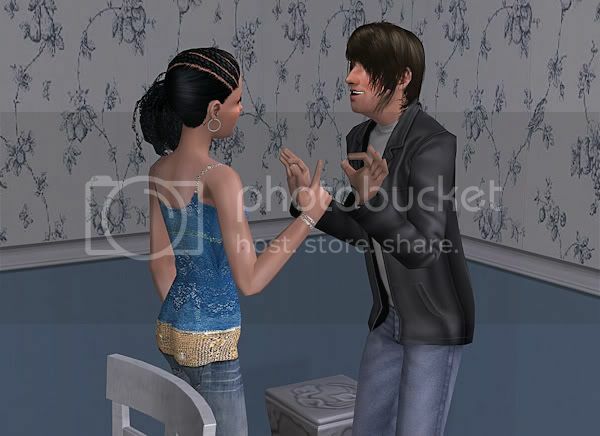 She smacked him on the arm, causing him to recoil in pain, followed by a laugh. Even as an adult, Rosa was the same. She would never change. Fujin may not have been able to follow in his grandfather Tsung’s footsteps, but he was still able to mess around with drafting and architectual ideas on his downtime. 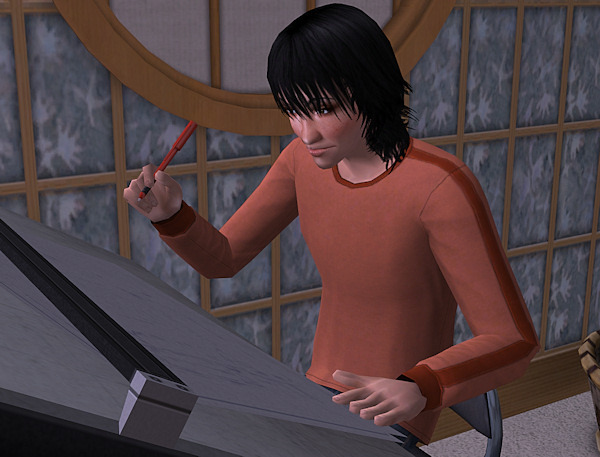 The room with Tsung’s old drafting room was his favorite and he spent countless hours in there. He knew he should be trying to find a special lady, but Fujin moved at his own pace. Right now, his mistress was the drafting board and that was just fine with him. Note from Mao: Another update, yay. Fujin is so laid-back, he’s a nice breath of fresh air compared to the rest of the hood. 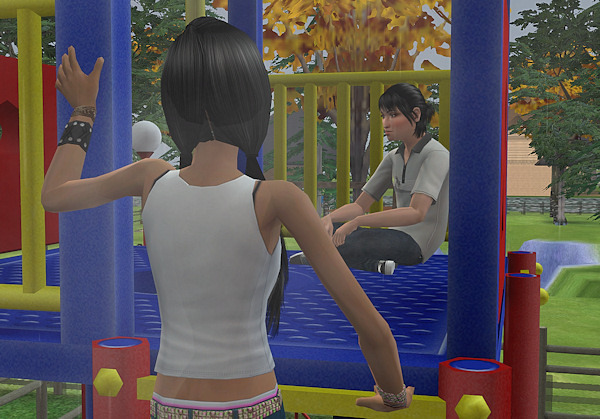 I had him relaxing at the playground when Grace popped up, prompting that scene. Grace is the type to get moodier as she gets older, she takes after her father, after all. 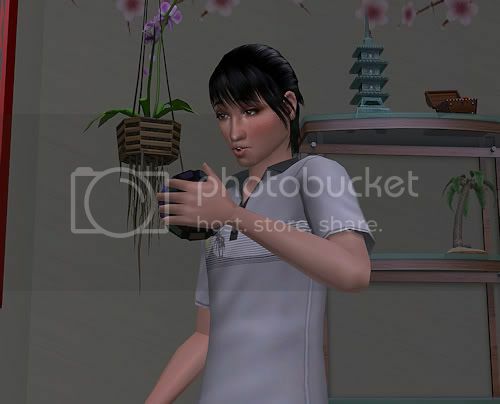 Rosa came over on her own, just as she used to come home with Fujin from school when they were teens. She always seems to get angry when they play video games, lol. If you didn’t get the noogie comment Grace made, it’s mentioned at the end of the Saunders, Round 26 entry. 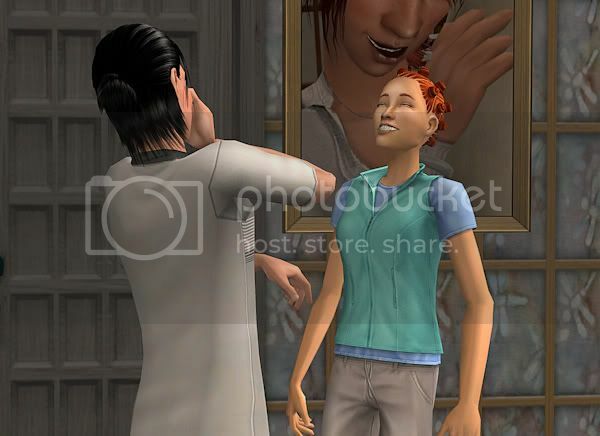 Note from Mao: I forgot to pull Emily’s child picture from SimPE before she aged to teen… so, um, she’ll be on the family picture next time! Fou-Lu and Elena needed to get out of the house, so they met up with Michael and Sade downtown. It took a lot of convincing to get Michael to come, he wasn’t one for groups, hanging out, or going downtown. Still, Elena missed her brother and managed to wheedle him into coming. Sade was just happy to show off her Awesome Tan to an even wider audience. Of course, their first stop was the pool table. It was still light out, even if it wouldn’t be in an hour, and it just felt wrong to hit the bar so early. They split up into teams, girls VS boys. Of course, Fou-Lu did enough smack-talking to make up for Michael’s quiet nature, but Sade was perhaps the worst. “What kind of shot was that, babe? Were you aiming for the wall?” Fou-Lu remarked, watching as the cue ball nearly rocketed a solid off the table. Thanks to Elena’s poor shot, the guys won. Fou-Lu’s idea of a victory shake, however, was quite different from Michael’s. While he’d never admit it openly, he did take a step back after Michael stopped reeling from the joy buzzer, his face twisted in anger. “All in good fun, man!” Fou-Lu said, laughing. They were only at the bar for an hour before it got ridiculously crowded. Sade was happy to share her tan with everyone, but some people were getting a little too close for comfort. Some guy in a ridiculous jacket had taken to following her around, much to Michael’s chagrin. “You’re the one who had to get that awesome tan,” Elena said, chuckling. They stopped at a diner on the outskirts of the city on their way home. It was quaint, but you could tell it was starting to get late, as the revelers and drunks were slowly filtering in through the doors. Fou-Lu took this quiet opportunity to ask about their vacation. Emily Davis was the opposite of her sister, Emma. She was polite, mild-mannered, and ignored. At least, that’s the way she felt. She was an amazing pianist, her skill surpassed even that of her father and sister, yet she constantly felt like she was stuck in Emma’s ever-looming shadow. She got accolades for her talents and perfect report cards, but it didn’t seem to be enough. Emma was always present in the conversations, her name mentioned several times daily. Emily loved her sister, but she was beginning to dislike her troublesome ways. She just seemed intent on keeping all attention focused entirely on her. It was no surprise, then, that when Emma visited, Emily made herself scarce. Elena and Fou-Lu sat her down, intent to have a talk with her. 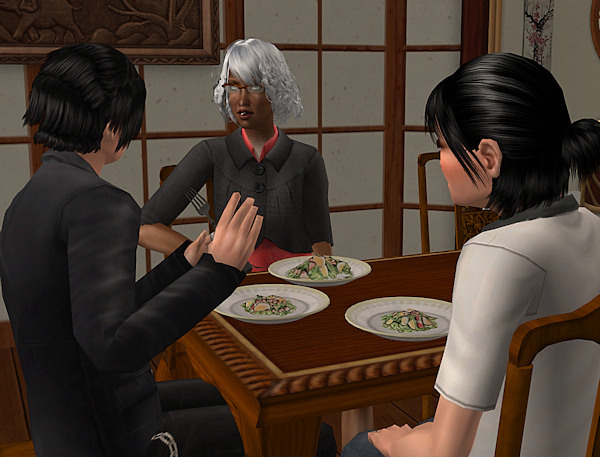 Elena had spoken to Gordon and was quite well-informed of her daughter’s misdeeds. She was hardly pleased. “I don’t know what you’re talking about,” Emma said, feigning ignorance. Elena stormed off, leaving Fou-Lu and Emma alone. Emily was there, but she played the piano quietly in the background, lost in the music. She wasn’t paying attention at all. It was just more ‘Emma drama’, after all, nothing new. Emily made friends, but it was difficult to keep them, especially when they lived all the way in Boreal Springs. Her favorite friend was Megan Alioto. They got along famously and Megan’s mother, Valerie, would even bring her downtown for visits. They weren’t sure why her mother always seemed to be going downtown, but they weren’t about to question it. It gave them a chance to hang out and play together. Emily’s birthday snuck up on everyone and before she knew it, she was a young lady. She definitely took a lot from her Saunders side, favoring her mother’s side of the family considerably. She still had her father’s eyes, though. She was still a sweet girl who was determined to have her own family someday. She certainly didn’t want to cause her parents as much trouble as Emma had. Note from Mao: Holy crap, Emily turned out amazing! I’m still kind of shocked. It’s hilarious what several generations of breeding will get you. 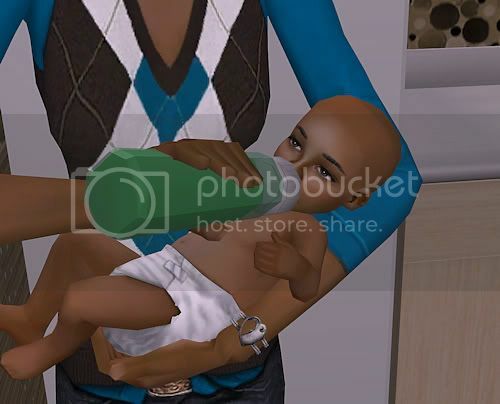 I didn’t start out with any default templates when I made my founding sims, they were all edited and tweaked. So it’s definitely cool to see it carry through generations. 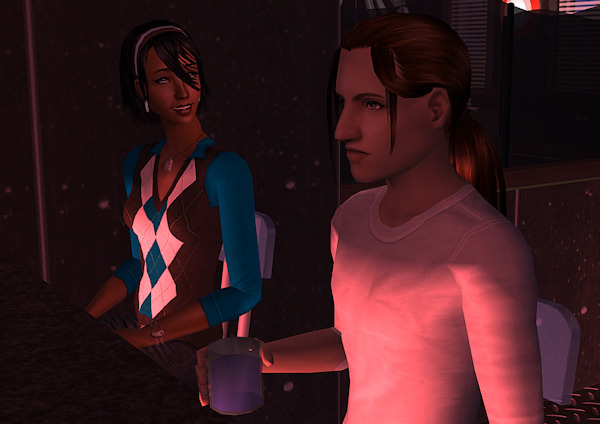 Sade and Michael autonomously stopped by the apartment, so I had them all go out for an adult outing. Fou-Lu is a day from becoming an elder and Elena is getting close, too. So they needed one last adult hurrah. Emma, also, is a little brat. She came over to see her parents and argued with them the ENTIRE TIME. None of that was staged. Any attempt made by Fou-Lu or Elena to speak to her resulted in negative reactions and Elena actually did get quite mad with her, lol. Some outtake shots. This one is from the diner. 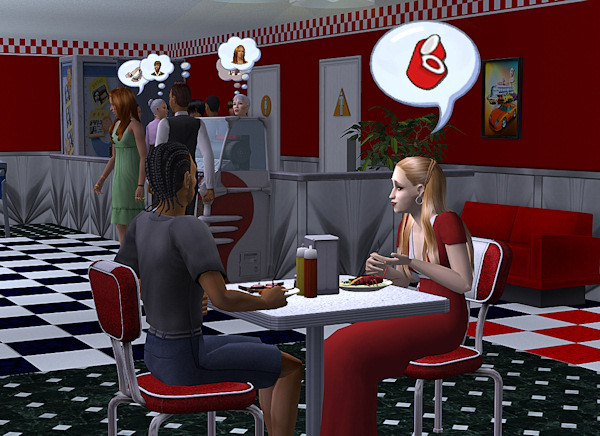 Why is Countess Emily Saunders chatting up some random downtownie about potty training Selene? Also, I just realized I have two Emily’s. Oops. I’ll just call one Countess and one not, lol. Sade’s Awesome Tan isn’t just useful to her, but her friends, as well. This cracked me up. Marcus Yu and Valerie Alioto never really expected to be parents, but they’re easy relationship has survived so far and Megan has both her parents under one roof. Will Valerie’s criminal activities put a strain on her family life? Megan was growing like a weed. Marcus had been considerably shocked when he found out Valerie was pregnant, he’d never really thought of himself as much of a ‘dad figure’. Fortunately, he’d adjusted to the role well and was teaching Megan the basics of walking. She looked a lot like him, but Valerie’s personality and facial expressions were evident, especially when she threw tantrums. Valerie, of course, did not see the resemblance at all in those cases. Valerie was busy trying to dig up as much dirt on her new employer, Gordon Saunders, as she possibly good. It had been her task, something to test her mettle. Gordon had told her that if she passed the test, she could consider herself one of his eyes and ears about the neighborhood. She was a good neutral source for information. She’d be expected to report on her friends and make friends with people he considered worthy of keeping an eye on. Luckily for Valerie, this sort of thing suited her perfectly. She was secretive, sneaky, and quite good when it came to being charming and manipulative. She was a little surprised by what she found on Gordon, though. She had gone back quite a ways, back to Janine Anderson-Saunders… where it all began. She met up with Gordon at the downtown cemetery late at night to report on her findings. It was a bit creepy, meeting up in a cemetary, but Valerie would have to get used to it. They needed to be discrete. “Hm, is that so? I guess I should find those openings and close them,” he responded, watching her reaction pointedly. “If anyone, for even a brief second, thinks you are associated with me? It’s over,” Gordon said, turning and walking away. Valerie took a breath, trying to calm her nerves. She was plenty confident in her abilities, but Gordon unnerved her in numerous ways. If she messed up, it was over all right, in more ways than one. She could read between the lines. She’d heard about the other things, the things people didn’t really talk about. Gordon wasn’t a bad guy, but crossing him was not usually a smart thing to do. Valerie had no intention of crossing him. She was more worried about her strange attraction to him. Marcus was pretty laid-back about her late-night meetings and usual busy schedule. He didn’t ask questions, he simply shrugged it off and jotted it down to Valerie being Valerie. She’d never been an open book. She spent as much time as she could with Megan, so he wasn’t about to raise any alarms. “Are you ever going to tell me what you do?” he asked as she joined him in the hot tub. Megan became a child and while she still looked primarily like her father, her mother’s traits were sneaking in there as she got older. She was a lovely young lady who was polite, though a little sneaky. If she was told to clean up her room, she’d simply shove it all under her bed and consider it done. Of course, Marcus and Valerie were ignorant to this fact until they checked under there and found all the items she claimed had gone “missing”. Despite Megan’s faults, she was a good kid. Valerie wanted to give her a medal for making her job easier and bringing home Nadia Knight from school. She happily introduced her new friend to her mother over dinner. Valerie wasn’t sure how anyone could be ignorant of Nadia’s parentage. She looked so much like Claude is was a little alarming. Note from Mao: Oh geeze, Valerie’s wants for Gordon have spread to Gordon. Bad vampire, no messing around with your minions! Sheesh. He’s going to try and populate the entire hood. I’m not quite sure what I’m going to do about them yet. Valerie is pretty casual about it, but Gordon, well, he does nothing casually. I’m hoping ACR keeps from deciding for me, lol. So far, everything has been purely platonic. Marcus, as usual, is blithely unaware. It’s better that way, really. 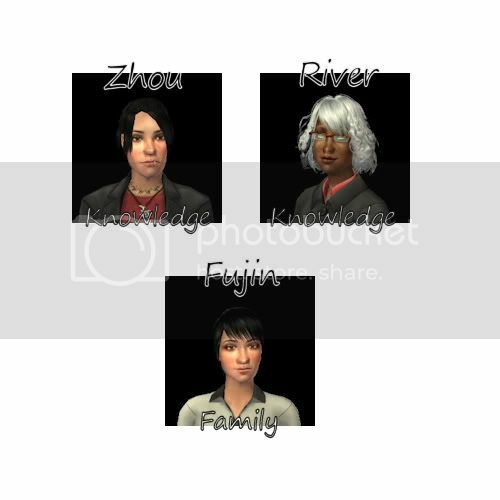 Zhou and River Yu are elders now while their son, Fujin, is just really starting his life as a teenager. Fujin, despite his penchant for the nerdy and obscure, is amazingly good with people. He likely inherited it from somewhere down the line. Some would argue that Zhou had his own ‘brand’ of charm, but Fujin shared very little with his father. The same could be said about his mother. He was an oddball, a nerdy but social creature who thrived of the laughter of others and poking fun at his own geekery. He was a merry spirit indeed. 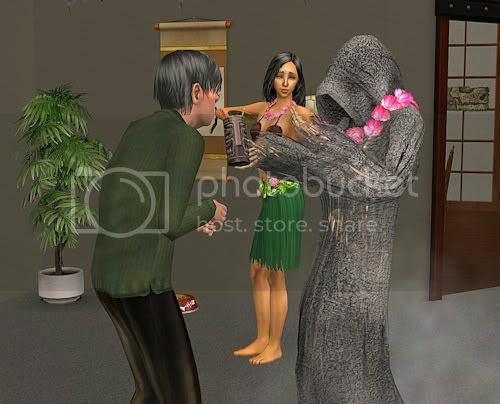 Unfortunately, even good humor wouldn’t stop the Grim Reaper from coming to collect. Chairman Mao’s time was up, she’d lived a long and fruitful cat life. She passed to the chorus of yowling cats and the frantic sobbing of her owners. In an effort to cheer everyone up, they adopted a new cat named Murphy. She and Apollo got on quite well and now the family was anticipating kittens. River was especially attentive of the expecting cat. Fujin got a visit from his older friend, Rosa Anderson, who was quite upset about her older sister’s recent homecoming. Rosa wasn’t known for her terribly understanding nature. Fujin eventually managed to calm Rosa down enough so she could vent her rage on video games. After mashing buttons and screaming at the pixels on the screen, Rosa took a calming breath and sat back, tossing the controller aside. Note from Mao: Nothing exciting here, just the same old, same old. I was sad to see Chairman Mao go! Here’s hoping Murphy and Apollo make cute babies. Zhou kept bringing home red heads (he brought three, excluding Rosa)… yet his turn on is blonde. I think he’s trying to tell me something? LOL! Fou-Lu Yu and Elena Davis have had a rocky relationship, but things are finally starting to even out for them. Emma is heading off to college soon and little Emily is growing more everyday. “Do you regret having me so young” Emma asked her mother at breakfast. She was starting to get nervous. Most of her things were packed already. Emma tried not to notice that her mother had turned it around on her. She finished up her pancakes and accepted her mother’s explanation for what it was, nothing more, nothing less. With Emma gone, the house seemed strangely empty. 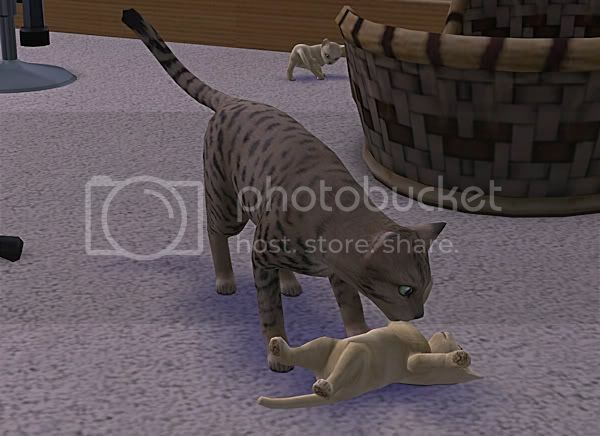 Even little Emily noticed the loss, preferring to sneak into Emma’s old room and sleep. At first, Six wasn’t too happy about her bed being occupied, but she got over it. Emily was company. Six definitely missed Emma. Everyone adjusted, though, and the days settled into a routinue. 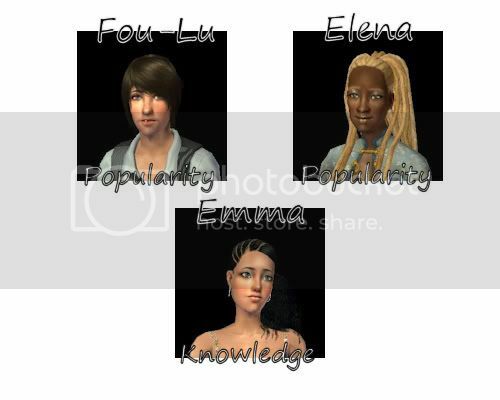 Elena kept up her career and Fou-Lu spent time with Emily. Of course, his true goal was to get Emily to say ‘dad’ before ‘mom’. Elena just shook her head and made a face when he boasted that she’d totally do it. She wondered how Emma was doing at school and hoped she wasn’t doing anything she’d regret. Emily grew into an active child who loved jumping on the bed. Elena would scold her, but Fou-Lu would usually encourage it or jump with her, much to Elena’s chagrin. Emily definitely resembled her Saunders heritedge, looking very little like her parents and more like her grandpa Gordon and his sons. The apartment was big, but clearly not big enough. Emily found out that the restroom being connected to her parent’s bedroom was quite inconvenient. She had several awkward exits, that’s for sure. Thankfully, her parents were nonethewiser. That was just one talk she really didn’t want to have, yet. Note from Mao: Emily looks SO MUCH like a Saunders it isn’t even funny. I see no Yu there. None. Wow. Also, Emma is at college now. Also, sorry that this update was so disjointed. I was trying to play through multiple crashes/etc. I’ve also increased the picture size. Marcus Yu and Valerie Alioto are expecting a child, but have no plans to get married anytime soon. Will this put a damper on Valerie’s career ambitions? During her pregnancy, Valerie tried her hardest to find some way to get in contact with Gordon Saunders. She’d tried doing it through his daughter-in-law, Sade, but that hadn’t worked. Michael had nothing to do with his father’s business, period. She could try Claude, but he was just as illusive as his father. Perhaps Elena Davis? But she was like Michael, disconnected from the crime syndicate herself. Valerie was hitting a brick wall. Valerie didn’t let pregnancy hamper her in anything, even in love. 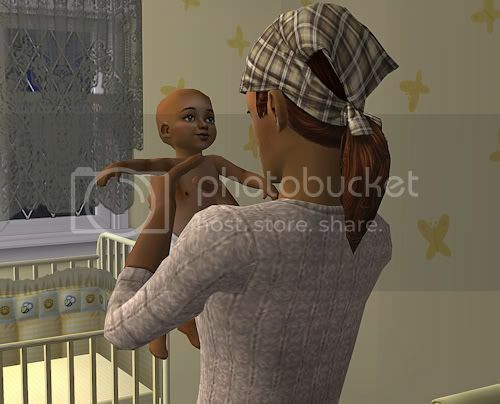 She was frustrated about not being able to pursue her dreams, but she knew she had to focus on the baby and ensure that Marcus didn’t think anything was up. She somehow doubted he’d be completely understanding of her need for criminal acts. 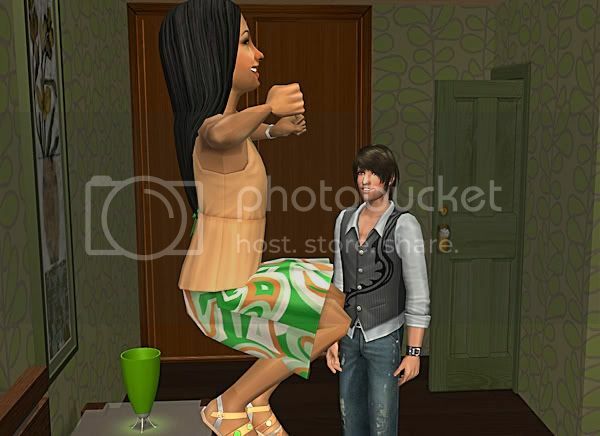 Motherhood hadn’t been something Valerie expected. She figured she’d be out planning heists and laundering money, not sitting in a nursery reading a book while her infant daughter slept. It didn’t change her goals any, however. Marcus was quite glad to have a little girl to fawn over. His sister had recently given birth to twins. All had been girls. Perhaps a boy would have been nice, but Marcus couldn’t deny that Megan was adorable. His heart melted everytime he held her. 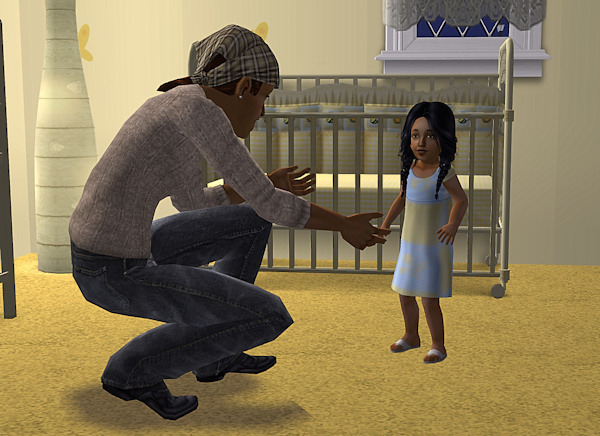 She made him want to be a more responsible and well-versed parent. Megan quickly became a toddler, much to both her parent’s joy. She wasn’t a difficult one to manage and she giggled quite often. It was obvious who she looked like now, but she showed hints of having Valerie’s fiery personality. Note from Mao: Poor Valerie, still no luck tracking down Gordon! He is very illusive. Megan is adorable. Tsung has outlived his younger brother, Shang, and his wife, Lilith, but he knows his time has finally come. Zhou and River are nearing their twilight years while their only son, Fujin, is enjoying his childhood. Tsung Yu knew his final days were upon him. He’d outlived pretty much everyone, except his once best friend Gordon. But Gordon would outlive them all with his… ‘unique’ condition. Tsung was ready to move on, though. He’d lived a good, long life; married the woman he loved; birthed two wonderful boys and enjoyed their own children. He was ready. Fujin, meanwhile, was just really starting to begin his life. He’d made friends with Francis O`Hanlon and they would often have chats. They were around the same age, but Francis lived in Aperture, so they didn’t get to hang out very often. When they did, they spoke of traveling and nature. Sometimes even science came up. Francis loved coming over because Fujin had a backyard, grass, and quiet. Tsung died quietly and painlessly. His family was quite rocked by the event. They all knew it had been coming, but no one wanted to face the loss. Things were tense and quiet for awhile. No one really knew what to say or do. Zhou and River were about to end their lives as adults and embrace their elderly years. It seemed strange to face mortality, to realize that someday, they would be like Tsung. Would they be as ready? Death was the farthest thing from Fujin’s mind. He was looking forward to his teen birthday. He missed his grandfather dearly, but knew how much Tsung had missed Lilith. Fujin was overjoyed when he could finally go to highschool and be ‘cool’ like all the other teens. Of course, Fujin’s idea of ‘cool’ wasn’t exactly on par with the general consensus. He enjoyed being obscure and eccentric. It suited him. He was intelligent and witty, but very grounded. He wanted a family someday, but for now? He was content to make friends and focus on learning. Zhou and River became older seemingly overnight. River swore the wrinkles weren’t there the day before. Her hair turned gray, fast, and instead of dyeing it, she embraced it. Why bother? Zhou was a little more vain, but his job forced him to be. He was a TV personality by now and so, image was still very important. The two looked as different as they always had, but over the years, had grown even closer. It seemed eons ago that they were awkward teens, bumbling around their friendship turned relationship. Note from Mao: TSUUUNG! I was so sad. But he’s with Lilith now… Fujin is such a sweet kid. I really enjoy him. Fou-Lu Yu and Elena Davis have been together, on and off, for what seems like a lifetime. 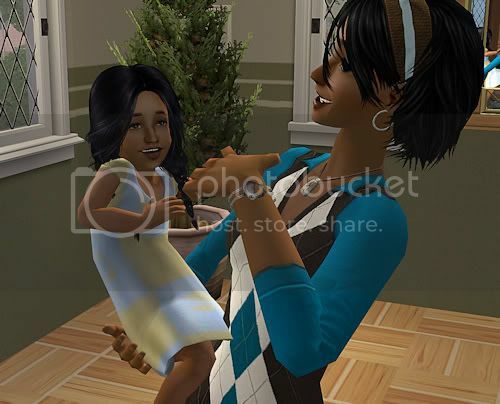 They were perfectly happy with their daughter, Emma, but Elena had a surprise pregnancy and now Emily has joined them. Will they all be able to adjust to the changes? Elena had been dubious about another baby, she worked enough as it was, would she miss seeing this one, too? She had been there for practically all of Emma’s firsts. It almost seemed wrong to deny little Emily that right, too. Still, Elena had been “alone” then. Her parents had helped. Fou-Lu was here now and he had every right to seeing the things he missed with Emma. Babies were a new concept for Fou-Lu. 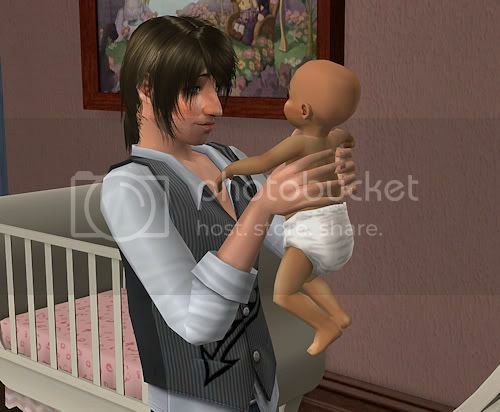 He vaguely remembered Zhou as a baby and he’d completely missed Emma’s early years. Babies weren’t nearly as fun to interact with as toddlers or children, though, and he could certainly do without the dirty diapers. Emma wasn’t nearly as accepting as her parents had hoped. She stayed in her room often, citing that she needed “time alone”. She didn’t necessarily dislike her younger sister, but her mind was preoccupied. Gregory Anderson had gone to college and she was left here. She had been convinced she had a chance, but if he was alone with Lydia? That chance was dying with every passing day. Emma still couldn’t wrap her mind around why Gregory was so adamantly going after a girl who didn’t seem to want him. Sure, they had been friends forever, but she was poor and Gregory had things to accomplish. Lydia couldn’t help with that, she wasn’t charming and cultured like Emma. Elena and Fou-Lu tried to spend time with Emma, to show her that it wasn’t all about the new baby. It was then that she revealed the baby wasn’t the reason for her being so sullen. She told them to just leave her alone. When she got up and went upstairs, Fou-Lu looked at Elena. “I feel old,” Fou-Lu sighed. Emma made a new friend, Daisy Saunders. She was nice and smart, too. Daisy had a twin, Sage, who was really popular but Emma didn’t really know her all that well. From what she’d heard, she hung out with Jennifer Knight and Rosa Anderson. Rosa was Lydia’s sister. That was enough to make Emma stay away. With her parents working a lot, Emma often got stuck babysitting her rapidly growing sister. Emily was getting big, fast. Emma was almost sad that she’d be leaving for college soon, probably not long after Emily was a child. She’d miss really getting to bond with her sister. Maybe having a sibling wasn’t so bad after all. It was just too bad Elena couldn’t have had her earlier! Note from Mao: It seems strange to me that Elena and Fou-Lu will be elders soon. That just seems wrong. LOL! Another generation in, another generation out. Emma is a strange girl. I’m interested what trouble she’ll cause next round in Uni. She’s younger than Lydia and Gregory. Also, a sidenote, I have a new blog Ocean’s 10. I know, I know, another blog? But it’s an easy one–it’s a VERY simple legacy type challenge where everyone uses the same founder. Check it out for more info. It won’t take away from BS. I have too much free time right now, I’m already on round 25!